Coll. No. 1203, 12 Jul 2015, characters observed: Annual, to 15 cm., of wet places; Leaves, basal and cauline, sheath 19-20 mm., not bristle-tipped, auricles 0, blade, 45 mm., rolled, not equitant (leaves of two ranks each folded in half); Inflorescence, >½ total height of plant, appears terminal, bract erect, ±=inflorescence, but does not appear be a continuation of stem, 12-15 heads per inflorescence; Perianth, 3-5-4.0 mm. ; Capsule, 3 mm. × 1.5 mm. wide, oblong; Seeds, 0.3 mm., brown, not tailed. Field Notes: Coll. No. 1203, 12 Jul 2015. 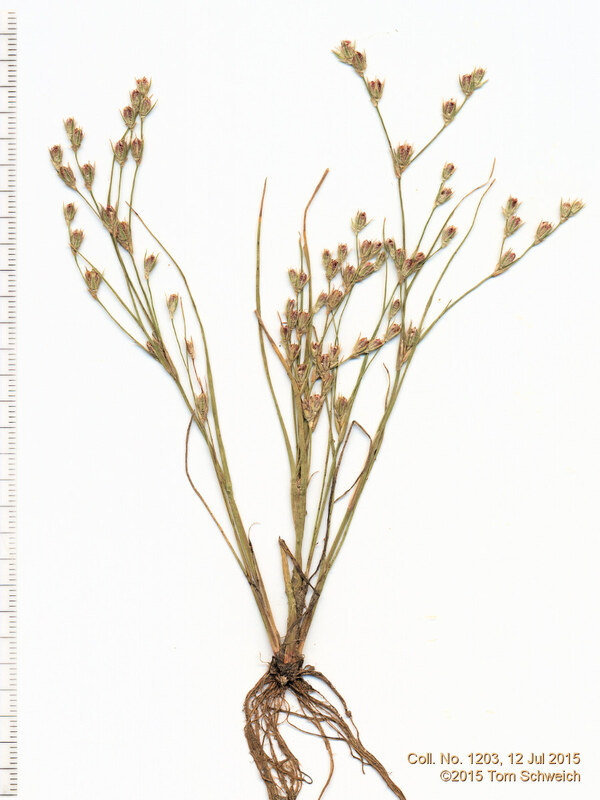 Other photos about Species or Juncaceae Juncus bufonius.